I know I am kind of late with this – Happy New Year! It was a long holiday season. Brandon was on vacation the week of Christmas and Dane had 2 weeks off from school. Dane was supposed to go back today but thanks to the lovely below zero weather his vacation got lengthened and he now won’t be going back until Wednesday. Now that the holidays are gone I am getting back to painting and getting some things listed in our Etsy Store. 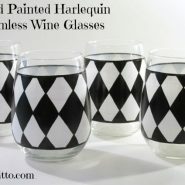 I was on a Harlequin ornament painting kick and I thought, why not do wine glasses too? I have 2 wine glasses almost done and 4 stemless wine glasses completed. 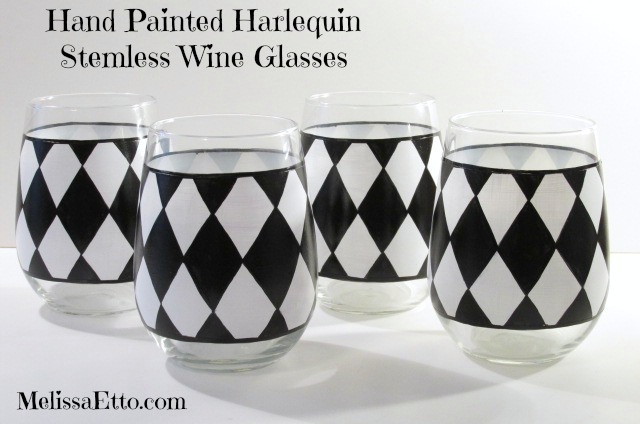 I listed the stemless wine glasses in our Etsy store today and will list the regular wine glasses sometime in the next few days after I heat set them. Brandon carved wings and now I have a couple Bat Wing Clocks ready to paint. I am planning on doing another Haunted Mansion inspired one and the other I am going to do with a vintage Halloween theme. I also have some other projects planned to keep me busy through the month of January.